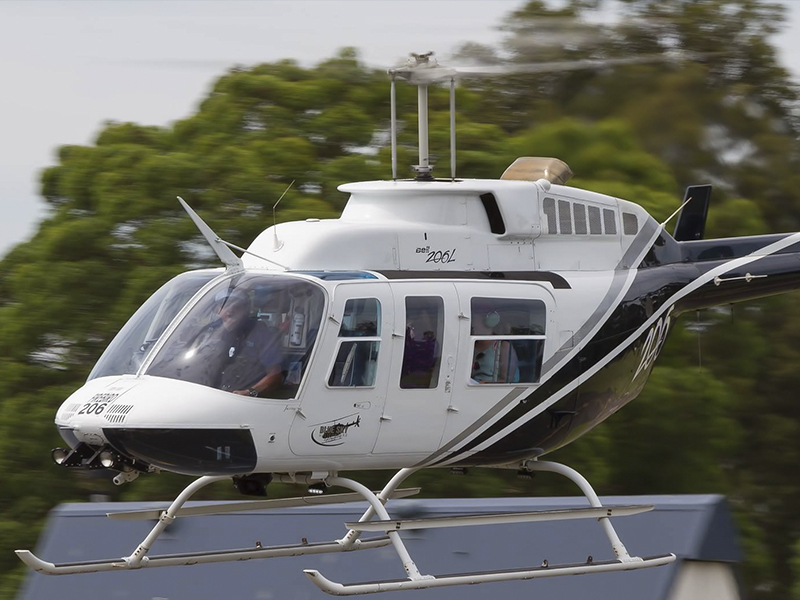 Blue Sky Helicopters is Sydney Airport’s longest established locally owned helicopter company. Book a 30 minute City to Surf “Private Charter” flight for two passengers and receive $50 off – normally $600! *Subject to flight availability and our usual T&C’s. Book a Private Charter flight for two (7 days) and SAVE $50. Enjoy a sensational flight aboard one of our Five Star helicopters and approx. 2.5 hours of delectable dining at The Reef restaurant. Premium & unique. Take in the views onboard one of our helicopters of the Harbour before heading west to the World Heritage listed Blue Mountains. Eat an unforgettable lunch with views. The Sydney Harbour & Beach Discovery flight offers panoramic views of the most beautiful city in the world. OUR MOST POPULAR FLIGHT. From the golden beaches to the icons of our world famous harbour enjoy magnificent panoramic views of Sydney. A panoramic light show appears before you as the city and Harbour turn on the night lights in the moments before the sun sets. Passing the city’s beautiful bays and secluded waterways, we fly over the Harbour and head for the beaches. From distant views of the magical Blue Mountains in the west to the shimmering waters of the Pacific Ocean in the east. See the views of the sparkling Harbour before heading west to the World Heritage status Blue Mountains. Offering you the very best in Fly & Dine. Blue Sky Helicopters has chosen three unique restaurants at three very different locations. Home of the largest horse riding and outdoor adventure centre in Australia. After flying over the shimmering waters of Sydney Harbour we fly north. Bathed in a beautiful misty blue haze, you’ll be in awe of the rugged wilderness and magnificent views of the Blue Mountains. Over the Northern coastline passing the Hawkesbury River and Watagan Ranges, we arrive in the picturesque Hunter Valley. Capture the wonder and beauty of our world by letting our pilots guide you and your lens to dramatic new heights. Fly over Sydney Harbour and head to the picturesque Southern Highlands country-side for a culinary experience like no other. Arrive at the Races by helicopter and enjoy the ultimate day in excitement and indulgence. Through the months of June to July and September to November, follow the whales’ journey along the Sydney coastline. Always wanted to see what your home and local area looked like from the air? This a unique flight experience like no other. Arrive by helicopter. Nurture yourself and indulge in a 3-hour spa treatments at The Spa at Chateau Elan in the Hunter Valley. Celebrate your marriage with Blue Sky Helicopters and make one of life’s milestones even more unforgettable. Tell us what you’d like to do, we’ll maximise your time to see the best of Sydney and beyond! Click here to complete our request form or you can simply call us. 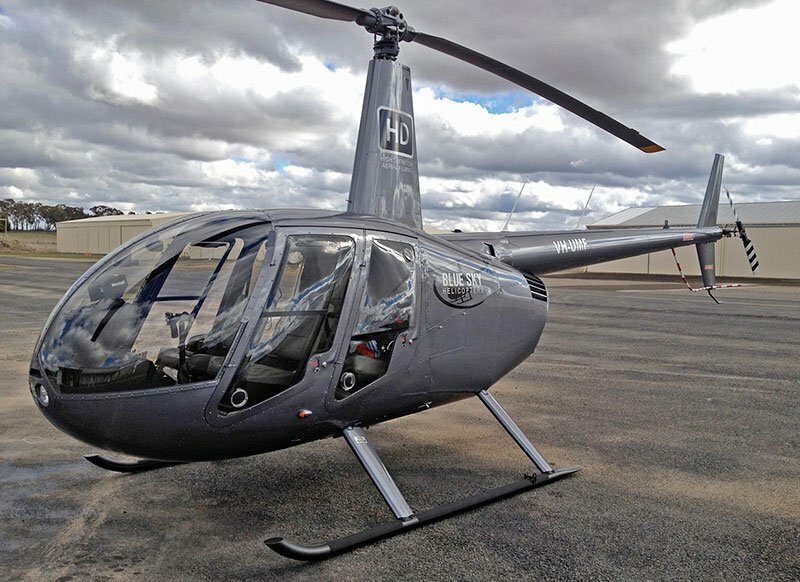 Blue Sky is the longest established & only locally owned & operated Helicopter Company based at Sydney Airport. The closest heliport to the city, beaches and harbour. As a locally owned business, you are dealing directly with us… Our heart and passion for showcasing Sydney (and it’s magnificent surrounds) can’t be outdone. Read more here on the Company profile page. As with all the camera systems we have developed over the years, We are always striving to lift the bar… Our latest system can’t be surpassed as we are now offering (and are the only company in the World to do so) switchable multi-camera High Definition 16 x 9 filming of your actual flight (complete with pilot narration, choreographed stereo music (using top of the line Bose A20 headsets) & Pilot/Air Traffic Control interaction). The film of your flight can be taken home on USB ($70) with you straight after the flight. With our first system, custom built in 1999, we are the leaders in onboard (real-time edit) Helicam in Australia. Blue Sky pioneered the original broadcast quality Helicam systems, now we’ve perfected it. Not one of our competitors can offer anything close to the the above system…Just Blue Sky! We operate the only R44 helicopter in the World with full surround view panoramic doors. See more images here. Return transfers from the City to Blue Sky Helicopters for just $75 each way / total cost for up to 4 passengers (Ford G6E Falcon/Holden Caprice) or for that really special occasion UPGRADE to a Mercedes S Class or a BMW 7 series chauffeured car for an additional $95 each way / total cost for up to 4 passengers. For Private Charter bookings greater than 60-minutes, a (standard) return City transfer is included free of charge. (Blue Sky passenger van or other third party provider). We have noticed a few companies advertising on the net that are operating in association (or under) other companies AOC’s (Air Operating Certificate). We strongly recommend that you only fly with a long established company (such as ours) that has it’s own AOC and company owned aircraft. Issued by CASA (Civil Aviation Safety Authority), this permission allows aviation companies to conduct commercial activities under the Civil Aviation Act. You can conduct an AOC search here on the CASA website. We don’t always claim to offer the cheapest scenic flights/tours but we are one of the the best at it (quality and cheap are not usually in the same sentence, especially in aviation! )… Our reputation in the industry speaks volumes.